The style of the lovely Art Nouveau Posters came forth within the final decade of the nineteenth century. People were getting tired of the sometimes “busy” Victorian style and were ready for something new, refreshing and different. This new movement had a desire to steer away from the stiff and somewhat rigid aestheticism and step into a new way of thinking. An example of this can be seen in the paler pastel-like hues now used for interiors to create an fresh and airy feel, rather than the earlier much darker colors which were commonly In fashion in the times before to Art Nouveau. The literal meaning of Art Nouveau is “New Art”. The term which first was seen around the 1880s was used about the artists greatly influenced by themes from Japanese, Rococo and Celtic Revival designs as well as the ‘Arts and Crafts movement. Animals, foliage and plants as well as other organic objects were incorporated into graceful art with soft smooth lines. It has come to describe the organic and flowing shapes of these decorative styles which first grew popular in France but was widely popular also in Germany, Belgium, Italy, Holland and Spain all the way to America across the ocean. The Art Nouveau movement increased in fame when the interior design gallery featuring this style, called ‘Maison de l’Art Nouveau’ was opened in Paris by Siegfried Bing in 1895. The movement of Art Nouveau saw art as a whole way of life and intended for art to be brought into all parts of life. The Art Nouveau style had its influence on a lot of everyday things like furniture, metalwork, ceramics, textiles, glassware, combs, jewelry and other decorations. It also made a big impact on interior design as well as architecture. Its flowing floral patterns were incorporated into windows, doors arches and more. Common door and window glazing was now replaced by more artful treatments. Beautiful patterns and organic subjects was popular on stained glass. The only trouble was that the cost to produce such fine things was relatively high compared to less intricate designs. Art Nouveau in turn has influenced other genres such as the German ‘Bauhaus’ and the Dutch ‘De Stijl’ in the 1920s. To Paris Art Nouveau was brought to fame mainly by the highly influential Alphonse Mucha Posters, much famed for his advertisements and amazing poster-work. 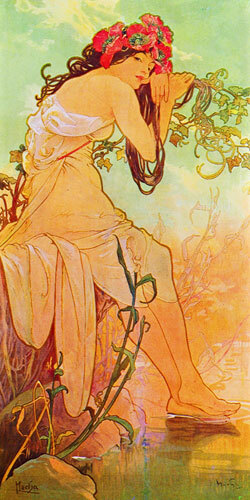 His Art Nouveau posters featured young females adorned with fluid contours of flowers and long flowing locks of hair. If the image was for an advertisement, the accompanying text was normally kept short and to the point, letting the image grab hold of the viewers’ attention. You can read more about this artist on our page dedicated to Alphonse Mucha. His work is considered to be among the most important when it comes to Art Nouveau Posters. Born about thirty years earlier was Jues Chéret who by some was called ‘Master of the Poster’. He was a splendid artist as well as technically pushing the boundaries of printing at the time. 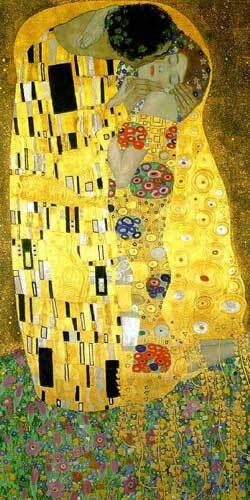 Around the same time in Austria, Gustav Klimt became one of the founders of ‘The Secession’ – which is what the Austrian equivalence to the Art Nouveau movement is called, although his style being somewhat different from both Mucha and Cheret. 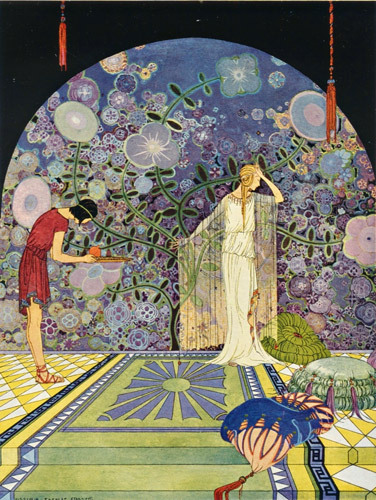 The charming story-book illustrations of Virginia Frances Sterrett incorporates the style of Art Nouveau as does the rising contemporary artist Daniel. 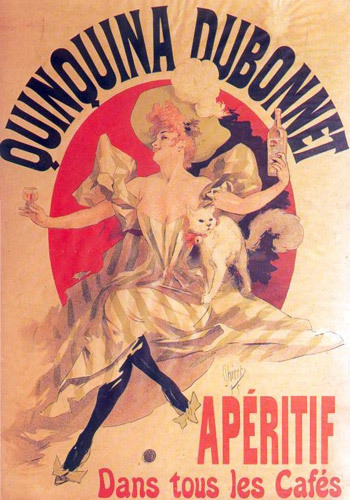 The Art of Nouveau Posters movement began in the 19th century. Initially it was basically a commercial thing for advertising, but then took a turn towards a whole new art form. Do you enjoy this website? Please pass it on to others using the share-tools below, or share your thoughts in the comments section.